I came from the Coe Hill area and we had 2 kinds of large turtles (still do). Both types are very dark, grow to about 16″ – 18″ in diameter, very aggressive. 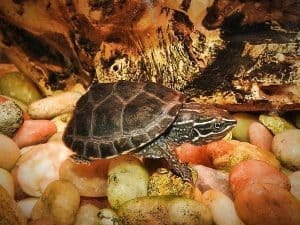 The main difference is one has a smooth shell and one has a spiked shell, 1 row on either side and horns at the tail area.The smooth shelled ones we called Mud Turtles and the spiked shelled we called Snapping Turtles. 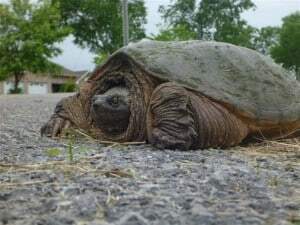 We used to go fishing every year for about 50 years to Cranberry Lake, now called Upper Rathbun, and there was very large, very old snapper that used to come to our campsite on the northeast portion of the lake. It would normally arrive by the time that we had our tents and campsite set up and wait near the shore for our catch which we cleaned on the shore. It would often hiss at us as we sat in the boat cleaning the bass/splake that we had caught as if telling us to hurry up with its supper. I was last there about 10 years ago and she/he still came to greet us after 50 years. Note: I’m quite certain that they were both Eastern Snapping Turtles. Smooth shells are actually fairly common in this species – even in large individuals. We don’t have Mud Turtles in Ontario, although some people refer to Eastern Musk Turtles as “mud turtles”. They are quite a bit smaller and only reach about 6 inches in diameter as an adult. It’s interesting that the turtles continued to show up year after year. It makes you wonder how old these turtles get. I’ve heard estimates of over 100-years-old! D.M.